Continuing from my Intro to Arduino post, this Instructable will go over some slightly more advanced topics with Arduino, specifically relating to controlling and managing many inputs and outputs. The next class covers how to connect the Arduino's inputs and outputs to MIDI. In the code above, we are only measuring the button once every two seconds, so it may take up to two seconds before a button press is detected, and very brief presses might not ever get detected at all. millis() gives us control over when events happen without putting pauses in the sketch. Each time we call millis() in an Arduino sketch, it returns the number of milliseconds since the Arduino was turned on. Here's how to use millis() to blink an LED without using delay(). You would end up with a very strange bug in your code. This may seem like an arbitrary range, but it comes from the fact that int's require 16 bits of space in the Arduino's memory, and with 16 bits of binary you can store numbers from 0 to (2^16-1) = 65535. But people decided that int should be able to store negative numbers too, so one of the bits in the 16 bit number is used to store the sign (positive or negative) and the remaining 15 bits store the value : 2^15 = 32768. Including 0, we end up with the range -32,768 to 32,767. Another data type called an insigned int does not store sign, so it gets the 0 to 65535 range that I calculated before, but you cannot store a negative number in an insigned int. When we need to use numbers larger than 65535 or less than -32768, we use a data type called long. Long is allocated 32 bits of space in the Arduino's memory. 2^32 = 4,294,967,296, center this around zero to get a range of : -2,147,483,648 to 2,147,483,647. Unsigned long's, like unsigned int's are always positive, so they range from 0 to 4,294,967,295. If you use millis() and you plan on keeping you project running for extended periods of time without ever turning it off or resetting, you should be mindful of this. One more comment about data types: We could have been using long's or unsigned long's this whole time when we declare pin numbers or other variables in the example sketches so far, but generally it's a good idea to use the smallest data type possible for a variable, that way you have plenty of extra space in the Arduino's memory for other things. In Arduino, longs are rarely used, but millis() is a good example of when they come in handy. currentMillis is an unsigned long representing the current time that is updated each time the Arduino's loop() function starts. (currentMillis - timeOfLastLedEvent) gives the time sine the LED's state was last changed, we compare this against the intervalOFF to see if it's time to turn off the LED, if it's not the Arduino will keep updating currentMillis and re-checking until it's time. debouncedState stores the current debounced state of the button, this is the state we are absolutely sure the button is in. By contrast, currentState and lastState store the current and last measurements we made of the button, but they do not tell us the state of the button with certainty because they may be affected by button chatter. debounceInterval is the amount of ms to wait for the button pin to settle before we know for sure what state it is in. I'm my last example I'd been using 1ms, here I'm using 20ms. timeOfLastButtonEvent is similar to timeOfLastLedEvent in the last sketch, it gives a time to compare with currentTime so that we can count how many seconds have passed since first detecting a button press. So far we've seen how we can use the Arduino to control many digital inputs and outputs at once, but sometimes we will want to control more components than the Arduino has pins for. In this case, we can use an external integrated circuit (also called a "chip") to expand the Arduino's inputs and outputs. Shift registers are chips which use logic gates to control many inputs or outputs at once. They are inherently digital, like the digital pins on the Arduino - this means that they can only read or write 0V and 5V (LOW or HIGH). If you are looking for something to expand your analog inputs then you'll want a demultiplexer like the 4051 (read more about how to use that here). In this Instructable we'll be looking at the 74HC595 shift register (called the "595"), it's very popular because it can expand 3 Arduino digital outputs into 8 outputs. next, new data is sent to the 595 by pulsing the clock pin("shift clock") and sending each of 8 output states through the data pin("serial data input") one by one. Arduino has a handy function in its library called shiftOut that takes care of this for you, I'll explain how to use this in the next step. finally, set the latch pin HIGH. This sends your new data to all the output pins at once (called parallel output). Next we'll take a look at the 595's data sheet to find the right pins to connect to. This first image above shows the 595 pin connections. There are 16 pins on the 595, labelled 1-16. Notice the half circle marking on one side of the chip, the #1 pin is always located on the left side of this chip. The rest of the pins are numbered around the chip going in the counterclockwise direction. The second image shows the pin name, ordered by pin number, with a short description. Pins 1-7 and 15 are the outputs Q0-Q7, leave those pins unconnected for now. Pin 8 is a ground pin, connect this to Arduino ground. Pin 9 is a serial data output, this is used to connect to other 595's for daisy chaining. Daisy chaining allows you to drive 16 or more outputs using just three of the Arduino's digital pins. It is a bit outside the scope of this tutorial, but you can read more about it here. Since we will not use pin 9, we can leave it unconnected (also called "floating"). Pin 10 is the master reset, when this pin goes LOW, it causes the shift register to reset - losing any data we might have stored previously. We do not want this functionality right now, so connect the reset to 5V to prevent resetting from happening. Pin 11 is the clock input or "clock pin", connect this to Arduino digital pin 7. Pin 12 is the storage register clock input or "latch pin", connect this to Arduino digital pin 6. Pin 13 is the output enable pin, when it is LOW it allows the 595 to send data to its outputs, we want this, connect this pin to ground. Pin 14 is the serial data input, connect this to Arduino digital pin 5. Pin 16 is the power supply to the chip, connect this to 5V. Your circuit should look like image 3. This code introduces a new data type called byte, byte is like int, but since bytes only require 8 bits of memory, they only store numbers between 0 and 255 (2^8 = 256). If you look at the states of your LEDs, you'll see that the LED connected to Q0 is on, Q1 and Q2 are off, Q3 and Q4 are on, Q5 is off, Q6 is on, and Q7 is off. So the LEDs follow the same pattern as the binary number, a 1 represents an on LED and a 0 represents an off LED. Now try other numbers, the number 15 is binary is 00001111, you can find other decimal to binary conversions on google by typing a # then the phrase "to binary" (the number it spits out will start with 0b, ignore that part and grab the last 8 digits). Remember that we can only send binary numbers with 8 digits in them (8-bit) to the shift register because it only has 8 output pins, so the value of numberToDisplay must be between 0 and 255. Now try changing the parameter LSBFIRST to MSBFIRST, you should see the order of the LEDs reverse, this variable sets the direction that we send the binary number into the 595: LSBFIRST means "least significant bit first" and MSBFIRST means "most significant bit first". 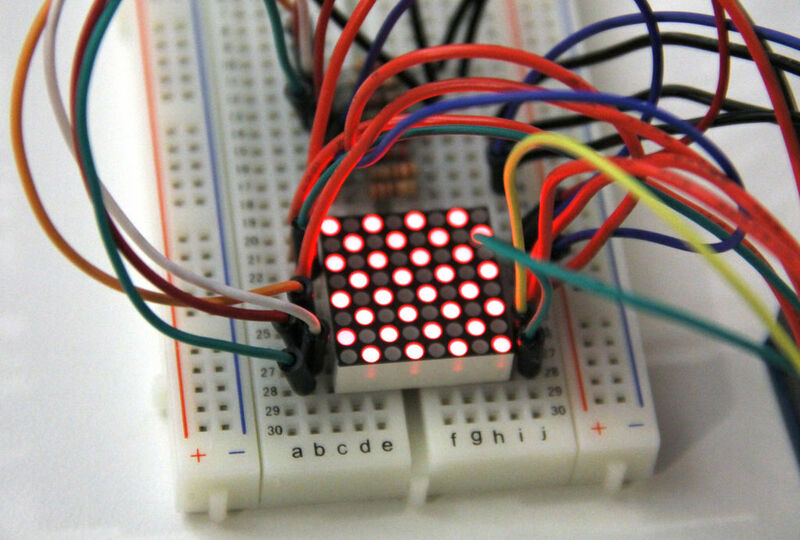 Next we'll look at using Arduino to control an 8x8 LED matrix, a grid of 64 LEDs. The 8x8 matrix we'll be using has 16 pin connections to it: eight pins connect the positive leads of all the LEDs in each column of the matrix, and eight more pins connect the ground leads of all the LEDs in each row of the matrix. This gives us control to adress each LED individually. Look at the diagram in the second image above. Image that all columns are grounded except column 8, which is connected (through a current limiting resistor) to 5V. No image that all rows are connected to 5V except row 1, which is connected to ground. The only LED that will light up in this scenario is located in row 1 and column 1. 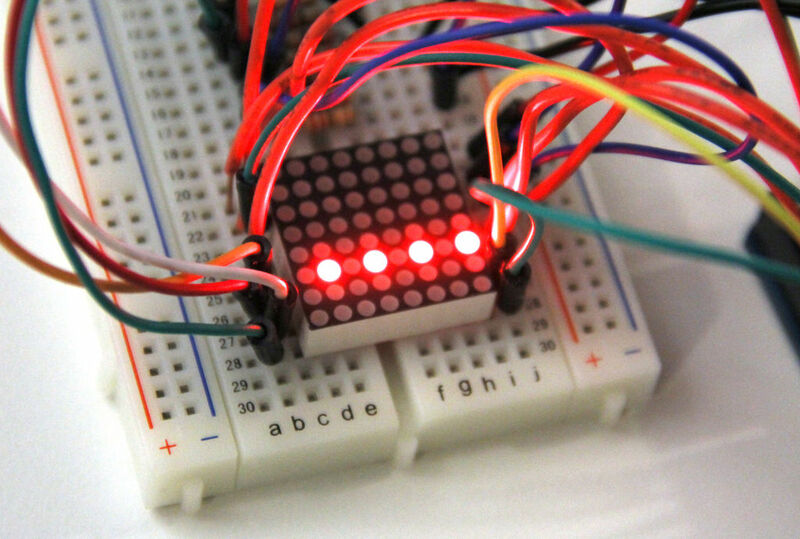 Place the LED matrix in a breadboard as shown in the first image. Use a current limiting resistor to connect the columns (see pin numbering in the second image) to 5V and use a regular jumper wire to connect the rows to ground. You should see the entire LED display light up. Now try unplugging a row from ground and connecting it to 5V instead, every LED in that row will turn off. Try connecting a column to ground, every LED in that column will turn off. The only thing a little odd about this code is that we're using analog pins as digital outputs, this is allowed by Arduino. Analog pins can act as digital inputs and outputs, but they have the added functionality of being analog inputs as well. We will be using many of the Arduino's pins in this example (16 total), so I had to start by wiring up some of the analog pins. Another thing, I purposely left pins 0 and 1 with nothing attached to them. The Arduino uses these pins to communicate over USB, and sometimes having things connected to pins 0 and 1 inhibits your ability to program the board. You should see a pattern of LEDs light up in the row that is connected to ground. One LED on, one off, one on, one off... and so on. This pattern is shown in image #3. Now remove the connection to ground from the LED matrix, and wire a different row to ground. You should see the same pattern across a different row (image #4). In the next step we'll use the Arduino to selectively ground each row. The output is shown in the last image above. This is called multiplexing. Even though it looks like we're lighting up many rows of LEDs at the same time, we know that we're actually lighting each row one by one, but we're doing it so fast that we've tricked our eyes into thinking it's all happening simultaneously. Multiplexing is useful any time to want to control a lot of things with relatively few pins. Instead of wiring up each LED individually, we can multiplex them and cut down on costs and hassle significantly. % is called "modulo", it is like division, but instead of returning pinNum/2, it returns the remainder of that operation. So if pinNum = 6, pinNum%2 = 0, because 2 goes into 6 evenly. If pinNum = 7, then pinNum%2 = 1. This gives me an easy way of figuring out which rows are even numbers and which are odd. Using this information, I can send different patterns to alternating rows. This code will only set A5 HIGH for the row connected to pin 8. This lights up only one LED in the matrix (fifth image). Remember how we used a number between 0 and 255 (a byte) to set the states of 8 LEDs connected to the 595? Now I've added a function called setStates() that lets us set the states of 8 LEDs in each row of the LED matrix using a byte. The first thing setStates does is set all the pins connected to LED matrix columns LOW to turn off any LEDs that might be on. Then it checks each binary digit of the 8-digit byte using the & operator; if any of the digits are 1, it sets the corresponding pin HIGH. And the resulting LED output is shown in the first image above, you can see that each 1 in the binary number corresponds to a lit LED in the matrix. The output is shown in the second image above. because the first (index = 0) element in the array is 0, and the second (index = 1) element in the array is 15. This circuit is using up a ton of Arduino pins so far. In case you need to connect other things to your Arduino, try using the 595 code and the LED matrix code to control the matrix using fewer Arduino pins (hint-connect the 595's 8 outputs to the 8 columns of the 8 rows of the LED matrix). You can even use two 595's, one to control the rows and another to control the columns. One thing to be aware of is that neither the Arduino pins or 595 are able to provide enough current to drive an entire row of LEDs at full brightness, so you might want to use something like the TPIC6B595 (a high-power shift register) if you're concerned about brightness. This same idea (multiplexing) can be used to control a grid of inputs, like buttons. I won't get into the details in this post, but you can find more info about that here (one slight difference between multiplexing buttons vs multiplexing LEDs is that when you wire buttons in a grid, you will also need to connect a diode to each button - the 1N4148 is good). If you're interested in working with grids of buttons and LEDs, you might want to check out this backlit button pad and PCB from Sparkfun. The easiest way I've found to control an LEd matrix is with the MAX7219 chip, it basically handles all the multiplexing internally, each chip can control up to 64 LEDs, and it requires only 3 of the Arduino's digital output pins, though it is a little pricey at around $11 each. There is a ton of info about using that chip on the Arduino website. The MAX7219 will not let you adjust the brightness of the LEDs individually, it will only control their on/off state. If you need to control the brightness of many LEDs, you might check out the TLC5940 (Arduino library here), though I admit, it is tricky to multiplex with this chip because of certain timing considerations - that would be a somewhat advanced project - but each chip easily controls 16 LEDs and you can daisychain them together to control more. Thanks for the great info!! Question... now how would I incorporate a switch into that? In your example, you connect resistors to the ground.. As far as I understand 595 send 5V to the leds (according to the byte shifting), so should not you protect leds by resistors, and short leg connect to the ground? it doesn't matter which order you connect leds and resistors in series. 595>resistor>led>ground is fine too. Most awesome! Good job Amanda!! I have a kinda related question maybe you or someone can direct me to the 'ible or info. I have 2 diy UNOs..I want one to send signals to the other to operate various servos etc a tx AND rx capability between them would be great too. Both need to do there own things until UNO1 tells UNO2 to do something else....make sense? ANY help is super appreciated! Lots in your instructable has helped me to get closer to a solution! Much Thanks! I might expect once the roll over to occur that your program would appear to stop working since it would take 49 days for left side to be larger than the right side (if ever). I actually take care of the 50 day rollover in my Vampire Killer project. Feel free to raid my code. Looks suspiciously a lot like my code....LOL! Thanks for the implied kudos! LOL. Because the Vampire Killer is intended as an "always on" device, and uses both a 2 second and a 1 minute timer which cannot be set up as delays, millis() had to be utilized AND the 50 day rollover had to be addressed - otherwise it'd screw up about every 50 days - and with 8 power outlets being timed, this could be a disaster if it wasn't coded like this. That function looks good to me, I'll mention it in the article when I get a chance. Thanks! Wow, this is awesome! Bookmarking this for future reference, thanks! I just got my ARDUINO Leonardo yesterday and was looking for some projects to practice code, so the timing of this Instructable was perfect - Thanks. You are a very good teacher! You also can use internal timers instead of delay() and millis(), the precision is almost perfect and never rolls over. //put here pinMode(), Serial.begin(), etc etc. TIMSK1 += (1<<OCIE1A); // replace "+" for OR function here too.